Sylvia Melikian oversees the real estate portfolios that MacFarlane Partners manages on behalf of its capital partners. She acts as the firm’s primary client contact and is involved in all portfolio-related matters, including developing and implementing investment strategies, and monitoring investment performance relative to portfolio objectives. A member of the investment and senior management committees, she also has led the firm's marketing efforts, having raised approximately $1.5 billion in institutional capital. Sylvia has more than 30 years of real estate experience, during which she has acquired, developed or managed more than $10 billion in commercial and residential real estate assets on behalf of pension funds and other institutions. 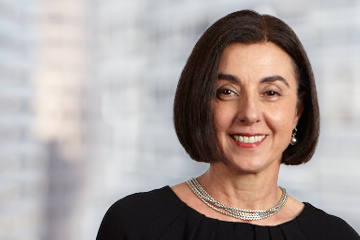 Sylvia’s career includes tenures as a portfolio manager and acquisitions director with MacFarlane Partners when the firm focused on core real estate investments in the early and mid-1990s. She began her real estate career with Aetna Life Insurance Company and later oversaw acquisitions activity on the West Coast for Aetna Realty Investors, an investment management subsidiary. She also was a partner in Lincoln Property Company’s industrial division, where she managed a staff of 10 professionals, oversaw the development and renovation of more than two million square feet of retail and industrial space, and served as property manager for another four million square feet of industrial space. Later, as senior vice president with AMB Property Corporation (now Prologis, Inc.), she led a staff of seven professionals in providing portfolio management services to private equity investors. She also was a senior executive with UBS Realty Investors, directing the firm’s asset management activities for $1.6 billion in real estate assets on the West Coast, serving as portfolio manager for several pension-fund clients, and assisting with business development efforts for separate-account services and commingled funds.